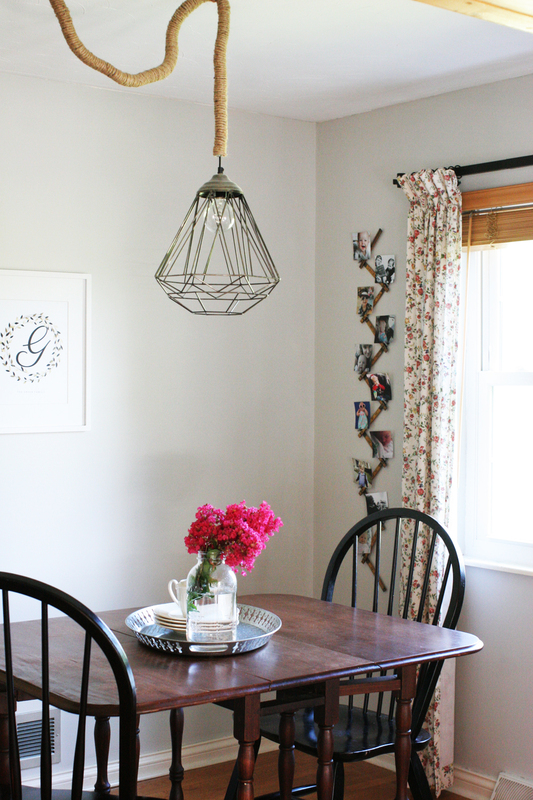 So many of you commented on the pendant light in the reveal of our Farmhouse-Style Breakfast Nook. It was a local find from one of my favorite small shops in Lexington, KY. 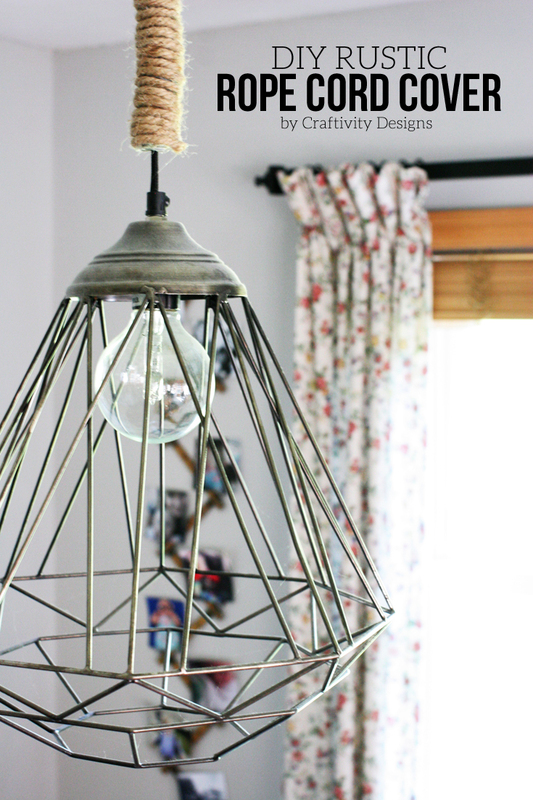 It had an industrial feel, which both my husband and I love, but the cord drove me crazy. It seemed small compared to the large light and wrinkled easily, as well. I wanted to add a cord cover, but the standard scrunched or pleated fabric covers seemed too traditional in style compared to the modern vibe of the pendant light. 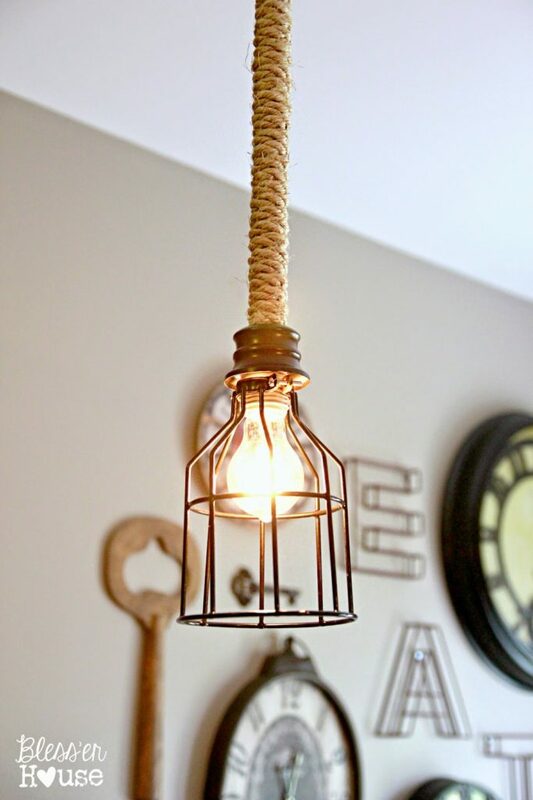 Instead, a rustic jute twine seemed like a much better compliment to the industrial design of the light. It was a pretty simple project, taking under a half hour, to create a rustic cord cover. Fit the Flex Tubing over the light’s cord and cut it to length. You can do this even if it is a ceiling light that is already installed because the flex tubing is split down the center. This allows it to be opened and placed around the cord, as opposed to sliding it onto a cord from the end. 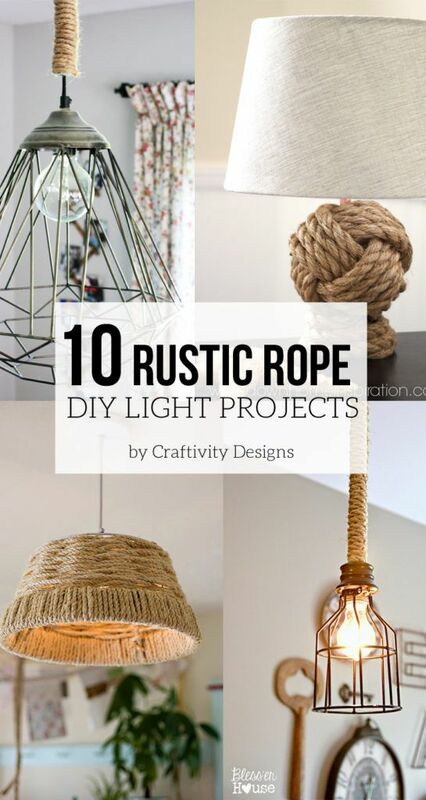 Next, take the Jute Twine and hot glue it at one end of the tubing. I chose to start at the top, near the ceiling. Once the glue has hardened, start wrapping it around the flex tubing until you reach the bottom. Be careful to keep the wrap consistent, not loosening or tightening the twine as you go. When you reach the bottom, hot glue it to finish the end. Quite simple, right? It really gave the light more presence in the room and balanced the size of the large pendant. The cord on our light is about 4 ft long and I spent approximately a half hour on this project. Obviously, a shorter cord would be quicker and you could also speed it up by having someone to help. I was working alone and it was manageable, but the second set of hands would have made it easier. This is a versatile project, you could use it on pendants, chandeliers, lamps — or even to hide desk cords. If you’ve got a desk floating in the middle of a room, this would be a great way to hide all the cords. 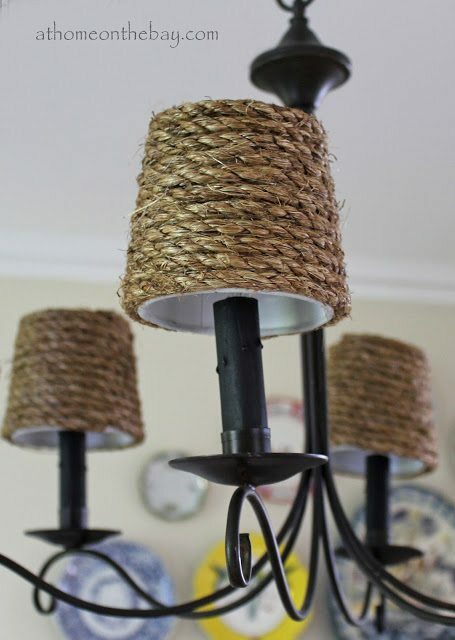 #1: Wrap chandelier bulb mini-shades with twine. 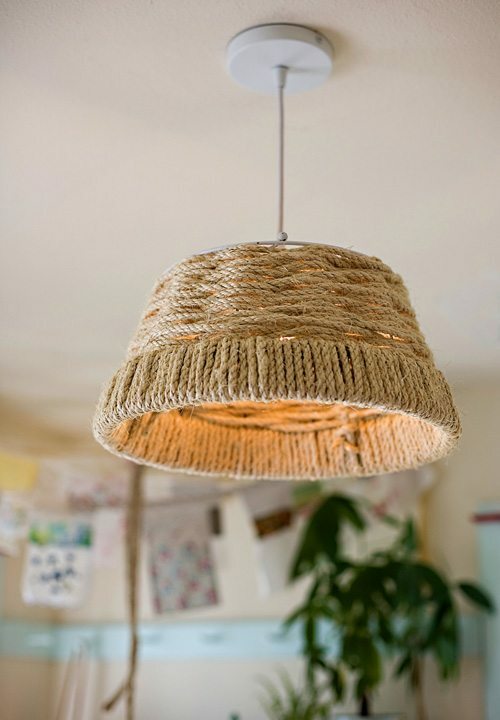 #2: Create a woven pendant from rope and a planter. 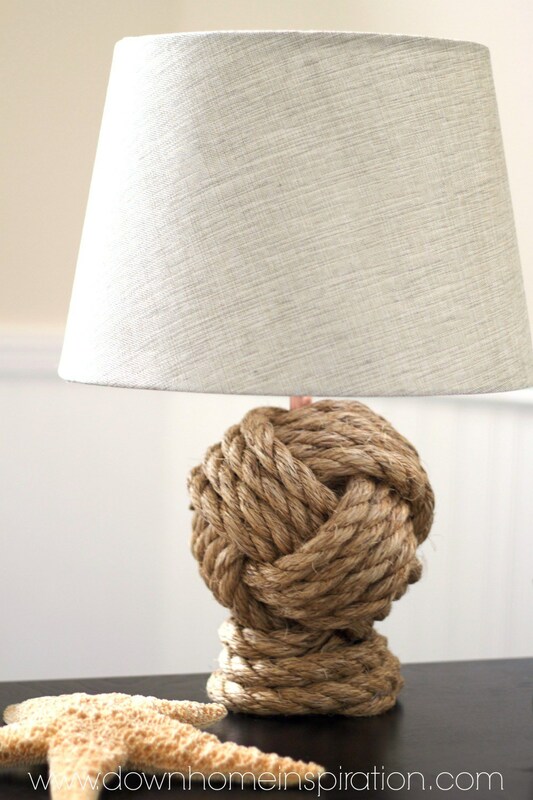 #3: Make a rope knot base for a lamp. 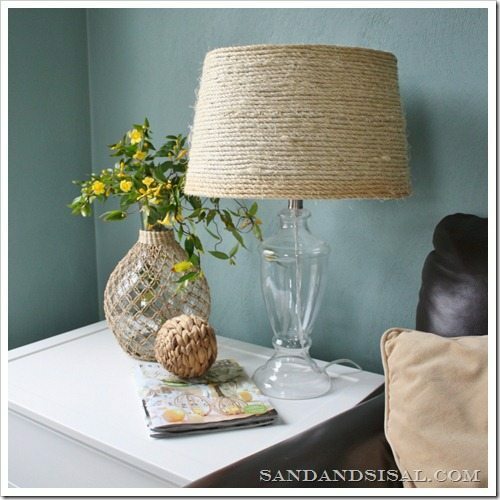 #4: Wrap a lamp shade in twine. 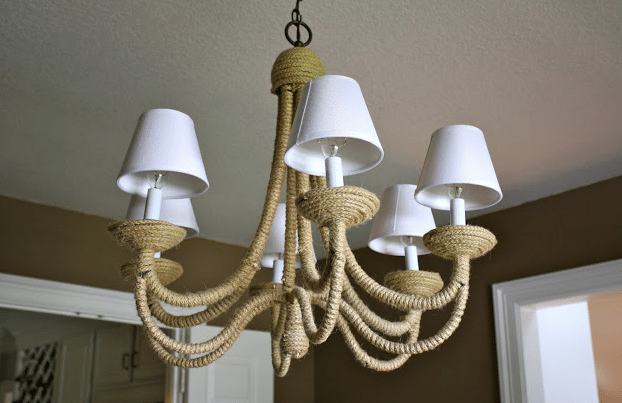 #5: Use twine to wrap an entire chandelier. #6: Wrap the downrod and switch out the shade on builder-grade pendants for a new look. #7: Makeover the base of a simple lamp with rope. 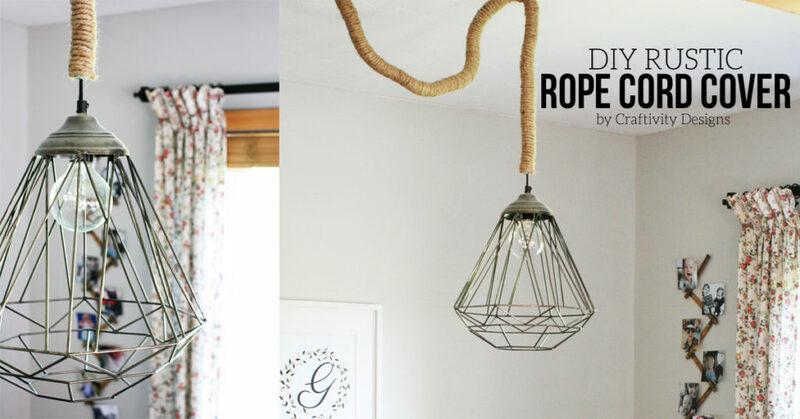 #8: Pair Hula hoops with twine and create the look of a high-end pendant. 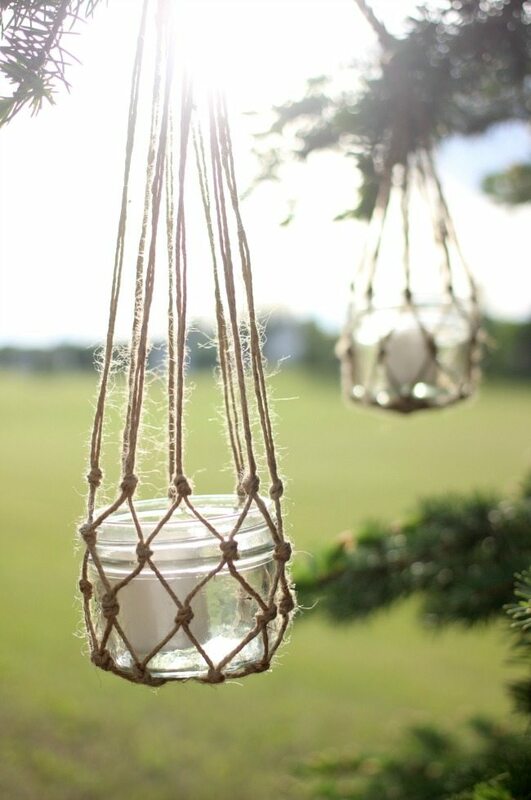 #9: Craft delicate lanterns with jute string and mason jars. Most of these projects are fairly inexpensive since twine and rope aren’t pricey items. 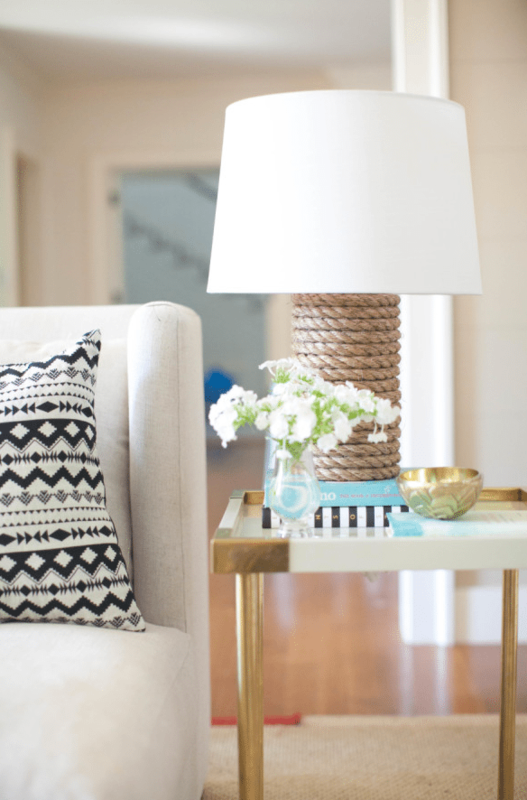 Take a look at the light fixtures around your home. What could use a rustic touch? Such a beautiful collection! 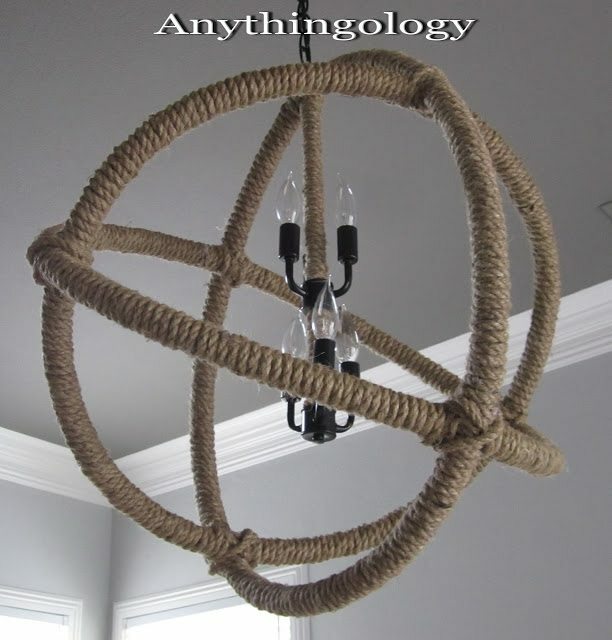 I would like to try the twine to wrap and entire chandelier.I think it looks really neat and I could probably get around it with using a second-hand chandelier anyway will be all wrapped up. Yes! 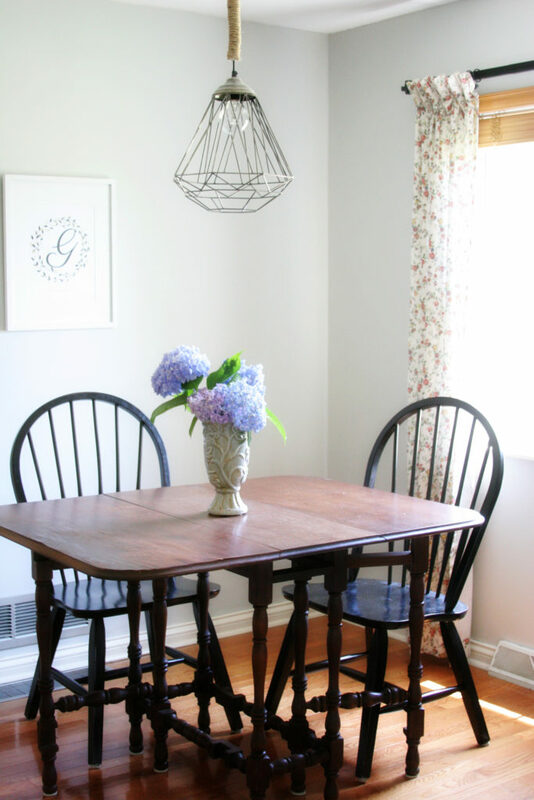 I think that is such a cool idea — and, like you said, would be an easy update for a second hand chandelier. You are so talented, Lora! I love how the light turned out. And you’re right, the jute twine really goes perfectly with a modern industrial look. Great job! I love simple DIY projects! I don’t have a lot of time to do anything complicated. I hate cords but never thought about wrapping them. It’s an easy way to clean up a mess of cords.